When the 8V Coupe was first introduced at the Geneva Motor Show in 1952, the car world collectively stood up and took notice. Developed in secret, the 8V, or Otto Vu, was Fiat’s first eight-cylinder vehicle, sporting a body and chassis that was both beautiful and groundbreaking. It was a watershed moment for the marque, boosting Fiat’s image to the same level as the other major Italian automakers. Part of this was the way in which the 8V catapulted Fiat onto the racing scene, garnering multiple top finishes and eventually going on to become the Italian 2-liter GT Champion in 1954. 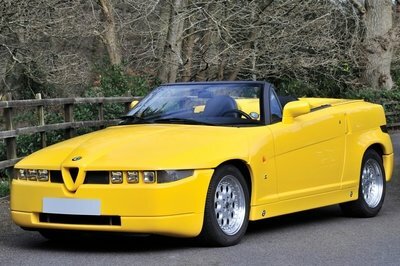 In total, only 114 examples were created, 34 of which were classified under the Reparto Carrozzerie Speciali, or “Special Bodies Department,” which saw coachbuilders like Zagato, Pininfarina, Ghia and Vignale hammering out custom designs that further increased the car’s desirability and aesthetic appeal. Only nine 8V Vignale Coupes were built, including the turquoise and blue example you see here. This hyper-rare, historically significant sports car was meticulously restored above and beyond show quality, taking multiple awards in various concours and driving events, including Best in Class at the 2002 Pebble Beach Concours d’Elegance. It recently went up for sale at the Amelia Island Auction as a pristine example of one of the world’s most valuable collector cars, and while it failed to exchange hands, its quality and attention to detail both inside and out is a fantastic example of handmade craftsmanship from a bygone era. 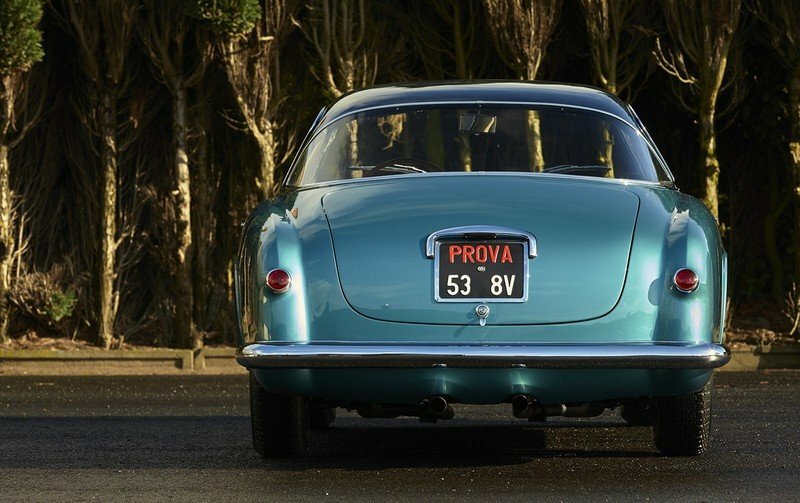 Click Continue Reading to learn more about this 1953 Fiat 8V Vignale Coupe. The original owner of this particular 8V, designated chassis code 000051, is unknown. However, it’s believed that the car spent its early years in France before arriving in the U.S. around 1957. The car, owned by a restaurant owner in Encino, California, was sold to Richard Egizi in 1958, and was subsequently stored as a project vehicle behind his family’s home in Woodland Hills, California. There it remained for nearly three decades before Egizi hired 8V historian Anton Krivanek to assess the car for restoration. In 1992, the car was sold once again, still unrestored, to Paul Forbes. Forbes passed the keys to Bruce Milner in 2000, who sent it to Auto Restorations in Christchurch, New Zealand, for an extensive, concours-level restoration led by Alan Stanton and Allan Wylie. 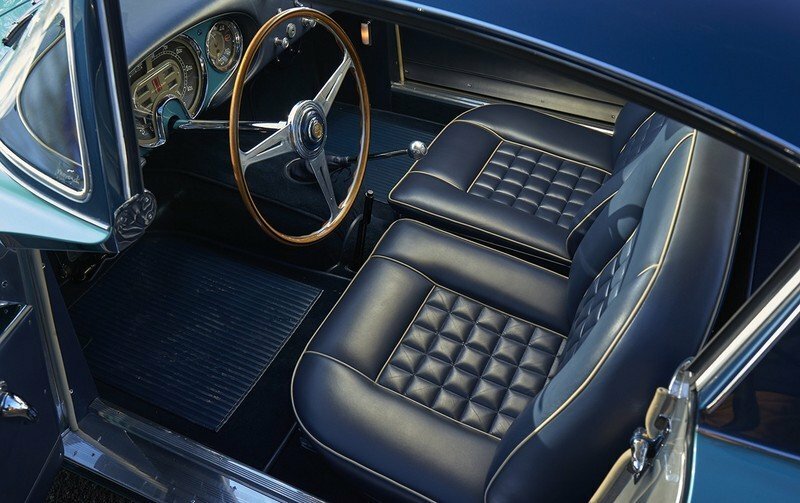 Over the course of the several-thousand-hour process, the restorers uncovered the vehicle’s original finishes, and thus, the two-tone paint, leather and carpets were all methodically recreated in their as-delivered appearance. Upon completion, 000051 made its show debut at the 2002 Pebble Beach Concours d’Elegance, where it took top honors in a field of seven other 8Vs. Milner then put the car on display for the next decade. In 2012, 000051 was sold once again, this time to an unnamed Southern California collector who took it to various international shows and events. It was during this period that the car’s original V-8 engine, numbered 000084, was reinstalled. In 2013, the car changed hands one final time, with the current titleholder retaining ownership after the car failed to sell earlier this month at the Amelia Island Auction. With a body by Italian design house Vignale, this particular 8V sports a flair all its own. The metallic blue paint was restored to factory quality, while the steel body panels sitting atop the tubular chassis are uniquely molded to form a shape that’s every ounce the classic sports car you’d expect. Given the exclusive coachwork design, you could even consider this particular 8V a one-off. 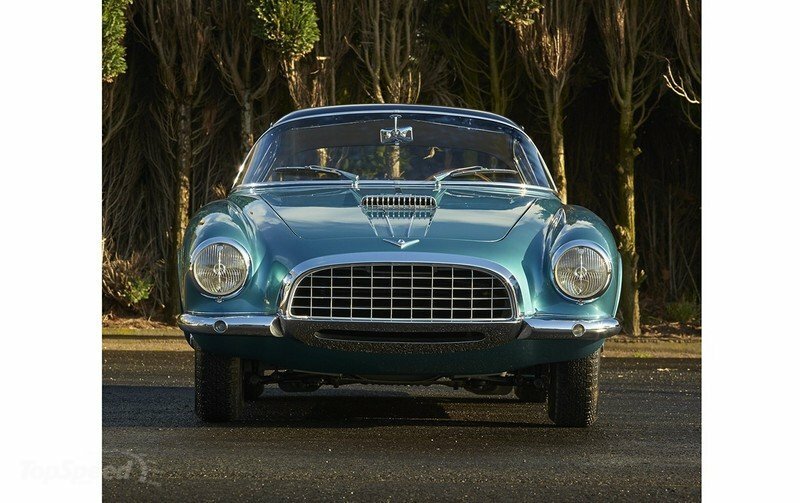 According to Fiat authority Tony Adriaensens, 000051 originally rolled off the factory floor in mid-1953, with Vignale’s head designer, Giovanni Michelotti, responsible for the styling. Design cues include a wraparound windshield and rear glass, which are set in a dark blue top that emphasizes the sporting lines below it. 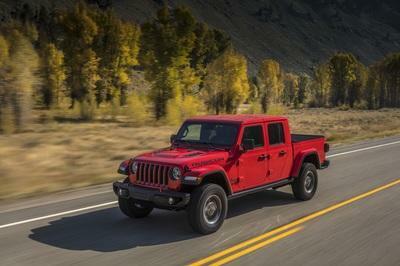 Chrome accents abound, including in the bumpers, circular headlight surrounds, grille surround, and in the slats covering the functional hood scoop. Twin tailpipes peek out underneath the center of the rear bumper. The wheels are chrome wire mesh. Finally, a conventional trunk completes the package. New Zealand upholsterer George Lee is the man behind 000051’s deep-blue interior, which sports the original square stitch pattern in the seats and on the doors. 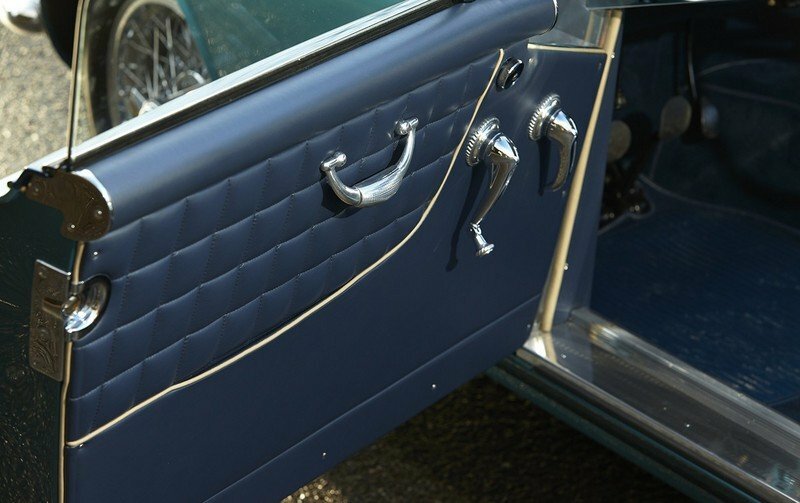 The dash is also lined with blue leather, with compound curves that faithfully recreate the factory look. A long shifter stretches out to meet the hands of the driver, as does an enormous thin-rimmed steering wheel. The gauges are set in the same turquoise blue color of the lower half of the body, with chrome surrounds and Fiat “otto vu” badging. Named after the engine that powers it, you would expect the 8V to sport something special under the hood. Fiat started development of the engine in 1945, internally labeling it Tipo 106. While originally slated for mass production, the engine instead found its way into the limited series sports car we know today. Dante Giacosa was behind the original engine design, which displaced 1,996 cc and had cylinder banks set at 70 degrees. 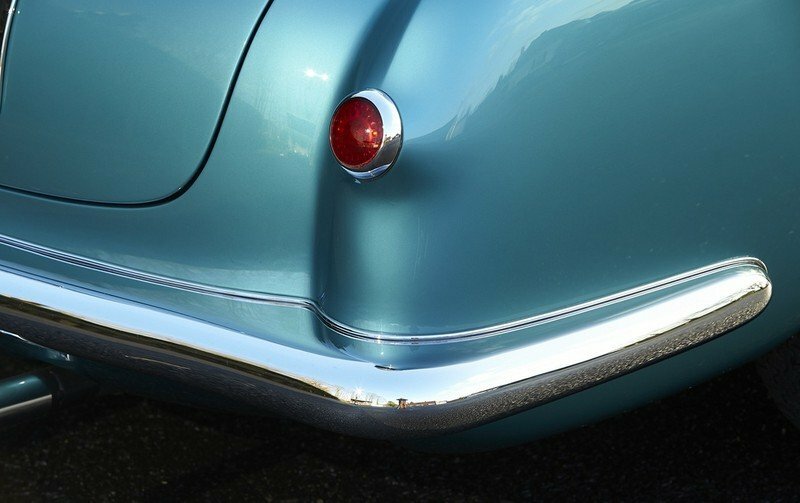 It was made from aluminum alloy, which made it very lightweight, especially for something from the early ’50s. It had a short stroke, blessing it with high revs and a steep power curve. While unused in any other Fiat model, the engine’s small dimensions prompted several other carmakers to copy the design, including Siata who used it in the 208S. Standard output was rated at 105 horsepower at 6,000 rpm, but Fiat offered an optional twin Weber carburetor package that added 10 horsepower. Some engines were fitted with four-throat Weber 36 IF/C carbs that increased output even further to 120 horsepower, but the intake manifold for these was less common. The transmission was a five-speed manual gearbox routing power to the rear wheels. Top speed was clocked at 124 mph. The 8V used a steel tube chassis and Fiat 1100 suspension components, with the body welded to the chassis using a semi-unitary construction. While the engine was quite advanced for its time, the chassis was equally forward-thinking, with four-wheel, fully independent suspension that utilized wishbones, coil springs and shock absorbers, all of which outclassed Fiat’s contemporaries. This combination offered both superb handling and relative traveling comfort, all from a short-wheelbase layout. Stopping power came from four-wheel hydraulic drums. When it was first released, Fiat advertised the 8V as a racing car, with several of the first examples prepped for competition and sold to hot-shoe customers. The Italian automaker created enough models to meet international homologation, and thanks to its low curb weight and tenacious handling, the 8V collected several trophies throughout its lifetime, including wins in road races, hill climbs, and rallies. With so much history and elegance to its name, a well-maintained 8V is sure to be marked with a sizable price tag. When it was put on the block as Lot 76 at the Amelia Island Auctions on March 13th, price estimates for 000051 ranged between $1.6 and $2 million. It ended up not selling, but other prospective buyers are sure to be waiting somewhere down the line. As a direct descendent from the 250 race cars of the ’50s, the 250 GT first popped into existence in 1954 as the 250 Europa GT. Eight years later, Ferrari released its successor, the 250 GT Lusso. Only 350 were built, making it one of the more rare Ferraris in existence. With a long nose that dives slightly towards the leading edge and a rear roofline that exhibits the gentle curves of a fastback, the 250 GT/L exemplifies the classic sports car profile with few detracting aesthetic features. 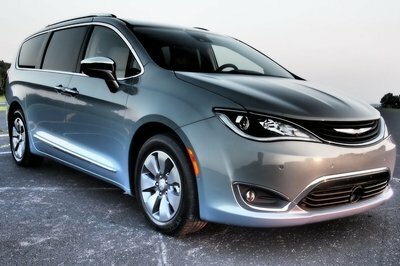 The front end employs twin-rounded headlights that are separated by a large oval grille, with copious chrome trim used throughout. 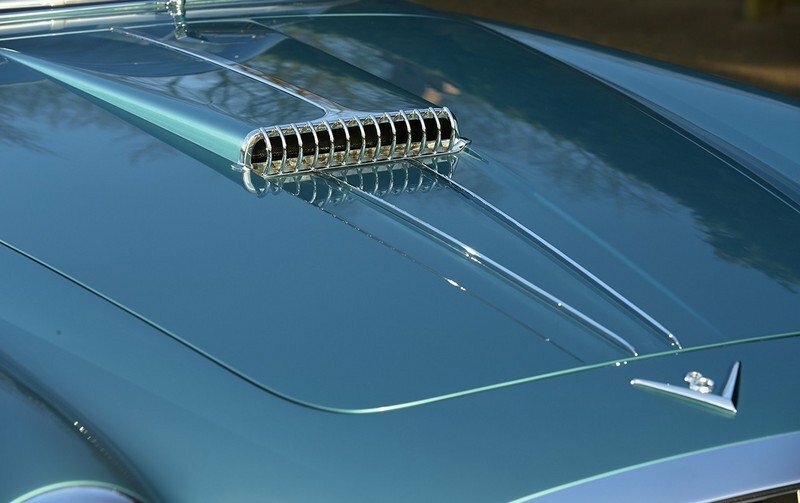 A small hood scoop sits above the engine bay, while wire mesh wheels handle roller duties. “Lusso” means luxury in Italian, and thus, space for two in the cabin is ample, with wide seats trimmed in leather. 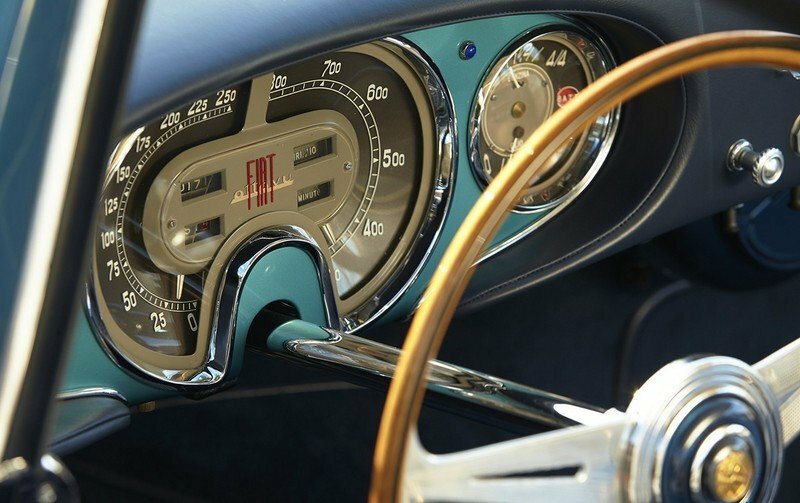 The steering wheel is large and composed of thin-rimmed wood grips, while the gauges are spread across the dash. Fuel level, water temperature, oil temperature, and oil pressure gauges sit in front of the driver, while the speedo and tach are both center-mounted. This makes for a layout that is less than useful for whoever happens to be driving, but boy, does it look good. Powering this Italian stunner is a 3.0-liter V-12 producing 250 horsepower at 7,300 rpm. A trio of Weber dual-choke carbs ease fuel delivery, while a four-speed transmission feeds the rear wheels. A run from standstill to 60 mph is done in eight seconds, while 100 mph takes 19.5 seconds. The quarter mile is done in 16.1 seconds at 91 mph, while top speed is an impressive 150 mph. Fully independent double-wishbone suspension is up front, while the rear makes do with leaf springs. Hydraulic brakes haul down the 2,249 pounds of curb weight. 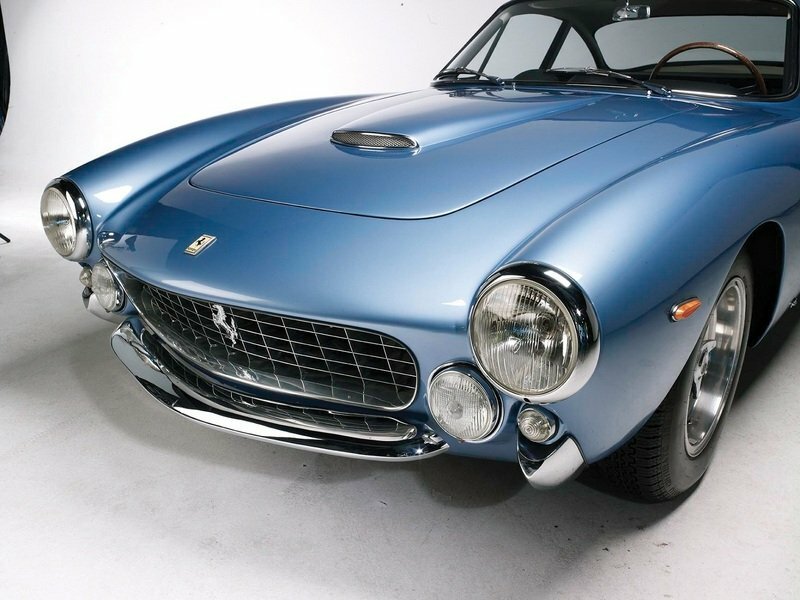 At the recent Amelia Island Auction, a 1963 Ferrari 250 GT Lusso with coachwork by Scaglietti was sold for $1.925 million. When it comes to rare, historic sports cars, the Italians aren’t the only game in town. Mercedes has a few examples of its own, including the 300SL Gullwing. Only 3,258 were built, with a mere 1,400 of those being coupes. Known best for tearing up Le Mans, road-going 300SLs are easily recognizable thanks to the long hood line, bulbous rear end and sharp windshield angle, not to mention namesake doors that open upwards as opposed to outwards. The cabin is surrounded by glass, while the trunk hangs huge off the rear axle. The interior features a dash-mounted rear mirror, aluminum trim, and driver-centric gauges positioned just behind a two-spoke steering wheel. The seats are actually rather form fitting, offering decent lateral support for a car from the 50s. 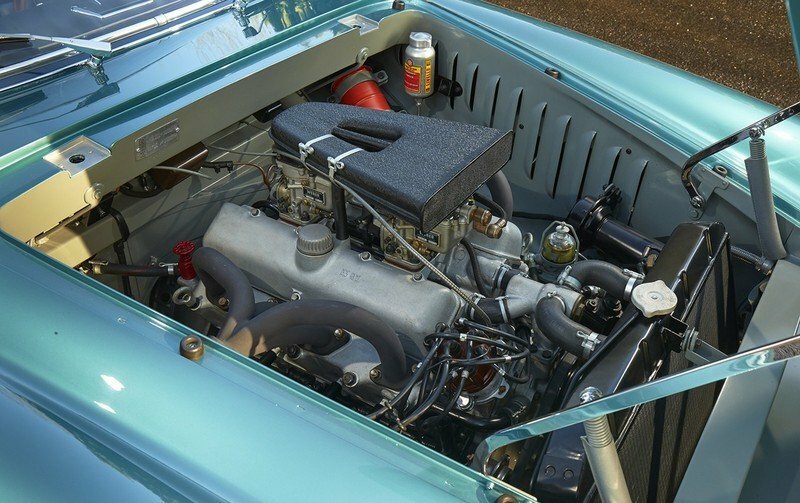 Standard appointment for the powerplant was a 3.0-liter straight-six with Bosch fuel injection, producing 215 horsepower at 5,800 rpm and 203 pound-feet of torque at 4,600 rpm. This was routed to the rear through a four-speed manual gearbox for a 0-to-60 time of 8.8 seconds and a top speed of 130 mph. 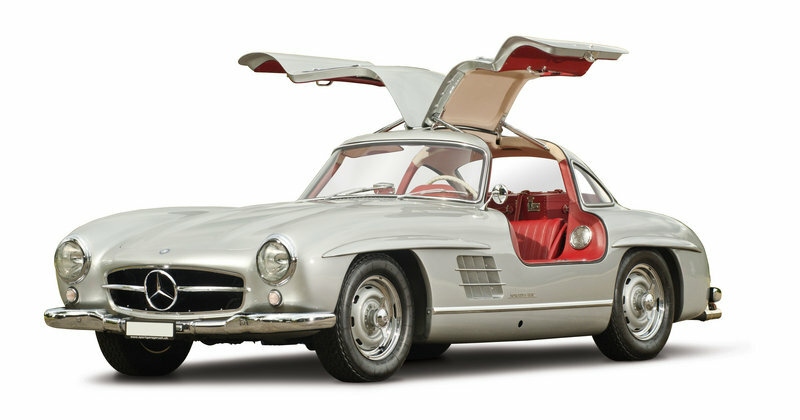 A 1956 Mercedes-Benz 300SL Gullwing was put up for auction at Amelia, but failed to sell. Estimates ranged between $1.55 and $1.85 million. Some consider the 8V to be the most important sports cars Fiat ever made after WWII, and considering the technology and design behind it, I’m inclined to agree. This specific 8V, also known as chassis number 000051, is particularly rare. Not only is it one of 114 8Vs ever made, it’s also one of 34 designated under Reparto Carrozzerie Speciali specification, one of nine Vignale coupes, and one of one in this particular body style. Handcrafted, unique, and historically significant are all adjectives you could throw at this machine. And in the era of mass production and overused templates, it’s nice to see the way things used to be. Gooding & Company, the auction house acclaimed for selling the world’s most significant and valuable collector cars, is thrilled to announce the presentation of three legendary motorcars to its Amelia Island Auction. Offerings include an iconic, champion Maserati driven by some of the greatest names in motor sport history and limited-production examples from Fiat and Lotus that notoriously catapulted their brands into the 1950s racing scene. Gooding & Company’s internationally-renowned auction will take place on Saturday, March 13, 2015 at the Omni Amelia Island Plantation in Amelia Island, Florida, commencing at 11:00am. Introduced at the Geneva Motor Show in 1952, the Fiat 8V Coupe surprised crowds and made headlines across worldwide auto news. 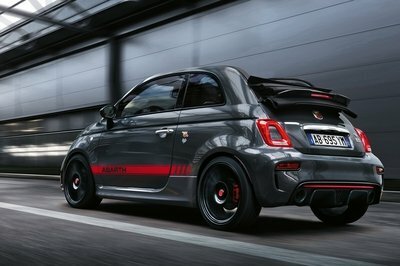 This was the moment and the model that put Fiat in the ranks with the other top Italian automakers. The 8V, or Otto Vu, was Fiat’s first eight-cylinder vehicle with a body and chassis of equal importance and innovation. 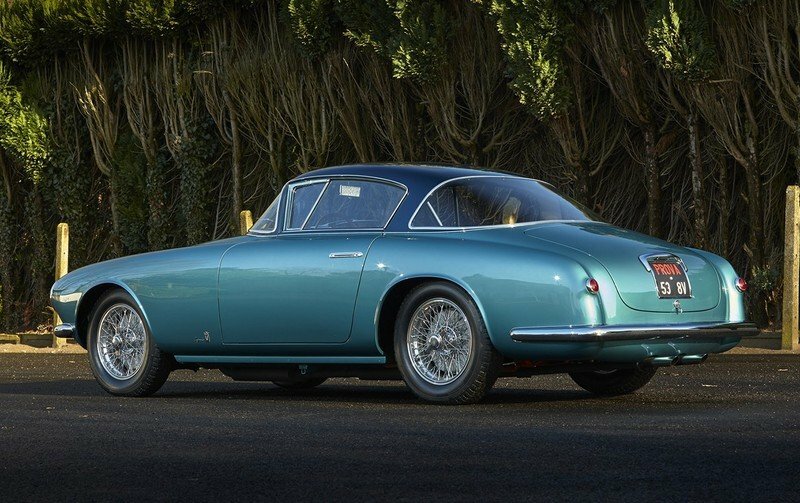 Just 114 of these extremely special cars were produced, 34 of which belong to an exclusive class under the Reparto Carrozzerie Speciali ("Special Bodies Department") with designs from Italian coachbuilders such as Zagato, Pinninfarina, Ghia and Vignale. 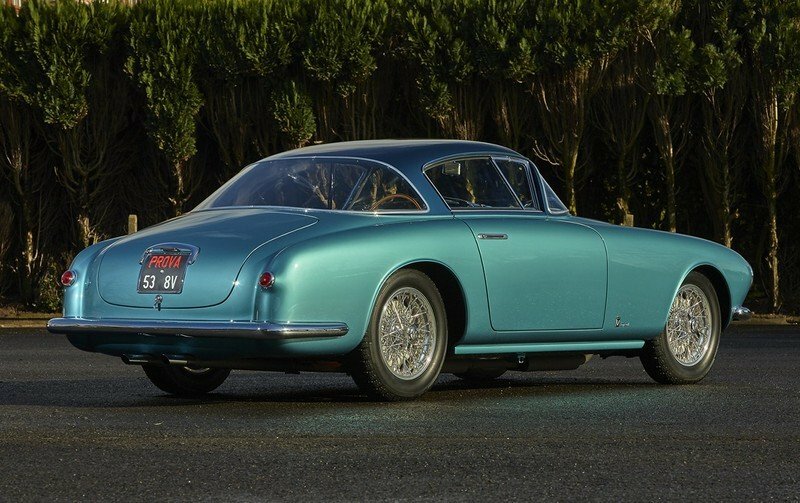 This metallic turquoise and blue example presented here is one of only nine Vignale bodied Fiat 8Vs. The Fiat 8V also became a new sight on the racing scene during the 1952 racing season, posting numerous leading results and eventually becoming the Italian two-litre GT champion. With a complete and beautifully authentic concours-quality restoration, the essence of its original iconic 1950s handmade Italian style is astonishingly present. The car exhibits impeccable craftsmanship, and the interior and dashboard are a design to be marveled. The quality and precision of the restoration was validated during its debut at the Pebble Beach Concours d’Elegance® in 2002 where it was awarded Best in Class. With its exceptional restoration and eligibility for a wide variety of automotive events, this 8V represents an exciting opportunity for those with a passion for ultra rare, historically significant Italian sports cars.